Valais is known as the most sun-blessed town of Switzerland and Visp enjoys around 300 days of sunshine a year. Visp is surrounded by traditional villages offering an authentic old-style atmosphere. Visp is the centre of the region with a number of the small ski resorts in the immediate vicinity. Popular ski destinations in the region including Zeneggen, Burchen, Unterbach, Torbel and Eischoll are easily reached from Visp. Also Visp has direct connections to Grachen, Saas-Grund, Saas-Fee and Zermatt. Enjoy incredible ski holidays around Visp! Visp is a small beautiful town located in Valais, Switzerland. The town is a home to 7000 residents, the majority of the population is German-speaking. It has many historic buildings and a pretty little town centre. Visp is regarded as one of the most important cultural and wine-growing centres in the Valais. The ‘Rund um Visp’ ski region consists of two primary ski resorts: the Augstbord region and the head of the Vispertal, including Visperterminen. A wide range of accommodation is available including hotels, holiday apartments, group accommodation and mountain huts. Visp is also a great shopping and leisure destination. Farmers' market (Pürumärt) is held every Friday evening, as well as weekly and flea markets. There are several other sports activities for you to try: snowboarding, carving, winter hiking trails and prepared sledge runs. Visp ski area offers a lot of possibilities to enjoy winter sports! Switzerland is known for its efficient rail network, but we still recommend you to order direct airport transfer to get to your chosen destination. If you will want to use public transport Visp town has a train station. Visp train station is in only 5 minutes walking distance from Visp city centre. We carefully calculate all resort transfer services individually, to ensure that our customers never overpay. Whenever you choose to travel and whatever your final destination, Alps 2 Alps will get you there for the lowest possible price. However, we advise booking early to access the best possible deal. In addition, keep up to date with Alps 2 Alps for the latest offers, deals and discounts on Visp town transfer services. All of the above will only ever result in our base-rate for ski transfers going down – we never over-inflate our prices at any time or for any reason. We also offer substantial discounts for off-peak, off-season and midweek transfers to Visp. If looking for the best possible deals, travelling outside peak season or midweek typically results in the biggest savings. We offer midweek (Monday to Friday) prices with up to 60% discount than weekend prices. Your transfer quote will also depend on vehicle availability, transfer schedule, vehicle utilisation and other costs like road tolls and airport parking charges. In all instances, we work hard to keep our prices low and are relentlessly committed to total value for money. Which is why we guarantee you won’t find a better deal on your Visp transfers, whatever your needs. The resort of Visperterminen lies at an elevation of 1,340m, with a max vertical of 998m and its highest lift going as far as 2,671m. 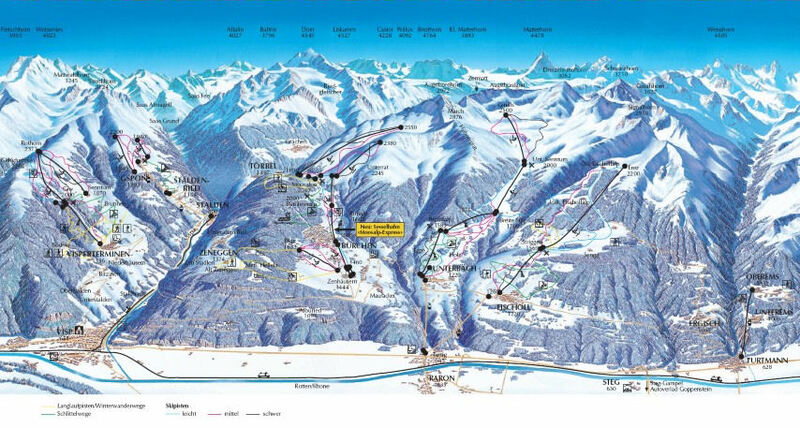 There are a total of 7 pistes in the immediate vicinity of the resort, served by masses of 5 ski lifts. Around 35% of the slopes are ideal for beginners, 50% serve the needs of intermediates and the remaining 15% is far more challenging. Visperterminen has 20 kilometres of pistes. There are 50 kilometres of cross country ski trails at Visperterminen. Valley run also is available. There are several ski resorts in Visp area and around Augstbordhorn, a free ski bus runs between Burchen, Unterbach, Torbel and Eischoll ski resorts. One ski pass gives access to all these ski regions. The ski area around Visp is very family and child-friendly. Every resort has slopes beginners and intermediates skiers. All of them can offer interesting activities for kids. There is also an indoor ice-rink in Visp while Burchen and Visperterminen have natural outdoor rinks. Use best tips for getting the most from your visit to Visp, the place has a lot to offer. You can witness the Bach Flower therapy during your visit to Visp. Also, you are welcome to experience the spectacular wildlife of Turtmann Valley, where you can watch tasty mountain cheese being made the traditional way of the show cheese dairy. The way we see it, Visp ski area transfers are about so much more than getting you to your final destination. After all, you also want to arrive comfortable, refreshed and ideally on time. Not all resort transfer services can promise this – Alps2Alps guarantees a higher-level service for every passenger. Keep your eyes open for discounts & special offers, and score the lowest price for your Visp and area ski vacation. If looking to secure your seats for the best possible price, booking as early as possible is advisable.